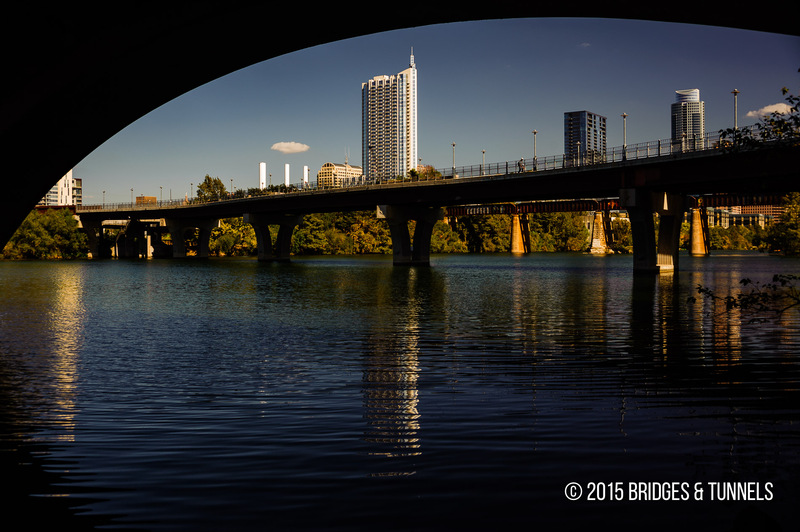 Pfluger Bridge is a pedestrian and bicycle crossing of Lady Bird Lake in Austin, Texas. 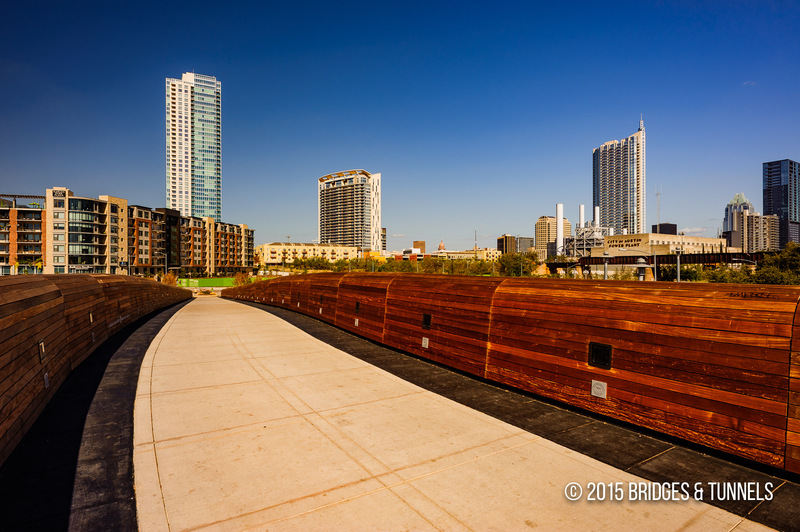 It connects downtown to Auditorium Shores and Butler Park. In the early 1990’s, the city of Austin secured $950,000 in matching federal funds to widen the South Lamar Boulevard Bridge as part of the Intermodal Surface Transportation Efficiency Act (ISTEA).2 The city signed a contract with HDR Engineering in 1995 to study the project alternatives, where all six options included various widening projects for South Lamar Boulevard Bridge. Meetings were held with the Texas Department of Transportation (TxDOT), the Texas Historical Commission, the city and other stakeholders. Early on, the Texas Historical Commission indicated that it did not want the existing South Lamar Boulevard Bridge altered as it was declared a historic structure.2 Attendees of public meetings regarding the bridge project also indicated that adding more lanes to the span was also not an acceptable solution. 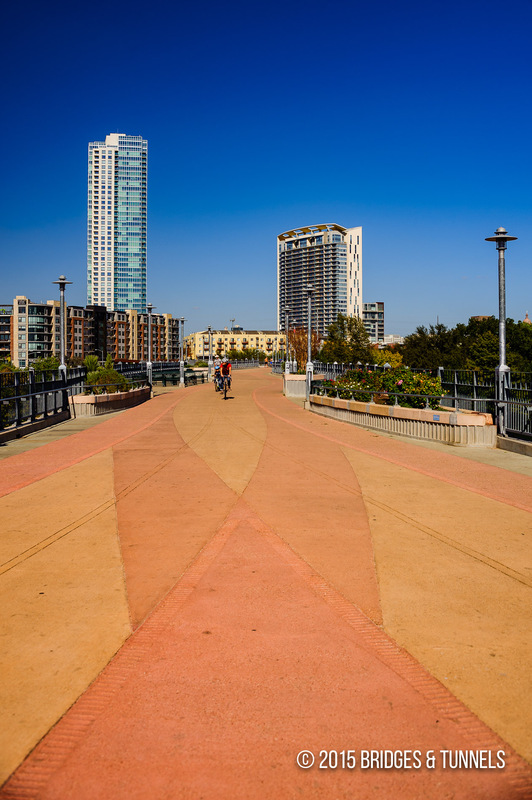 In March 1998, the city council directed HDR to explore the option of designing a separate pedestrian and bicycle bridge across the Colorado River. 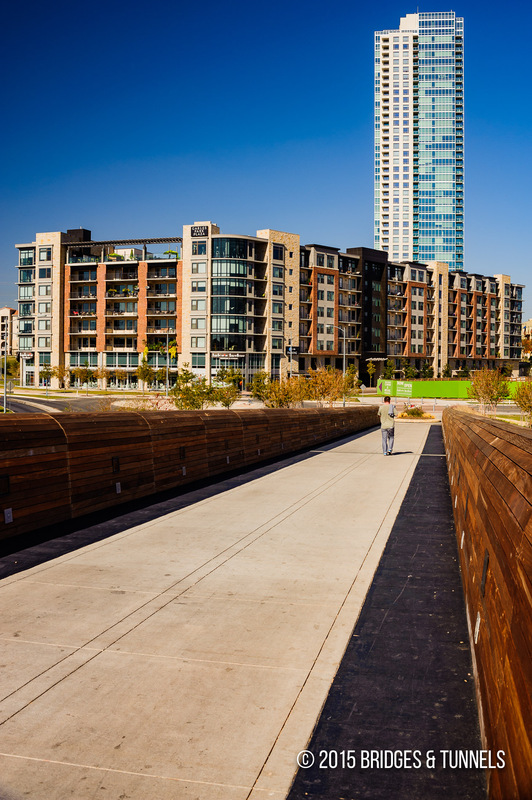 Many felt that such a span would not solve the ongoing woes of the South Lamar Boulevard Bridge, but the city believed that it would create a safer crossing for pedestrians and cyclists. A workshop with key stakeholders was held in May 1998 and fifteen concepts were developed that included cable-stayed, arch and beam bridges, and the relocation of an existing, historical truss bridge.2 One of the more innovative concepts presented was the “Double Curve” concept that was developed by Chas Tonetti, Tere O’Connell, Jamie Wise, Rush McNair and Chris Hutson. Their concept was based around the “paths of travel.” The architect stated that the bridge would have no straight lines and that it would be shaped around an hourglass, which resulted in a curved span with helical ramps and curved connectors. Unit A: The southwest ramp, a two-span continuous unit ranging from 86’to 120’constructed of horizontally-curved composite plate girders. with a width of 23′. Unit B and C: The southeast ramp, a two-span continuous unit constructed of a 48′ span of composite rolled beams and 111’span of composite plate girders, with a width of 23′. Unit D: The central three-span continuous steel plate girder units 114’each, with a variable width of 31.3’to 42′. Unit E: A triangular unit with a northeast ramp consisting of a single span unit 104’long and 21′ wide; a single span unit 109′ long and 26′ wide; a single span unit 49′ long and 18′ wide, all constructed of composite plate girders or composite rolled beams. Unit F: The northwest ramp, a four-span continuous steel plate girder with two composite steel girders. Unit G: A continuation of the northwest ramp, a nine-span, conventionally-reinforced concrete slab and T-beam unit. The combination of Units F and G resulted in a free flow crossing over West Cesar Chavez Street. The construction contract was bid twice.2 The first round included four bidders who were all heavy bridge construction contractors known to buy steel pipe in Dallas and all were exceeded the maximum budget for the project. That forced the city to eliminate Units F and G, the northwest ramp, from consideration from initial construction and the bids were released for the second time. Only two bidders put in estimates and a contract was awarded to Jay-Reese Contractors of Austin in April 2000. Groundbreaking was held on May 15, 2000 and the new crossing was completed ahead of schedule on June 16, 2001.2 A grand opening celebration was held that included hundreds of runners. 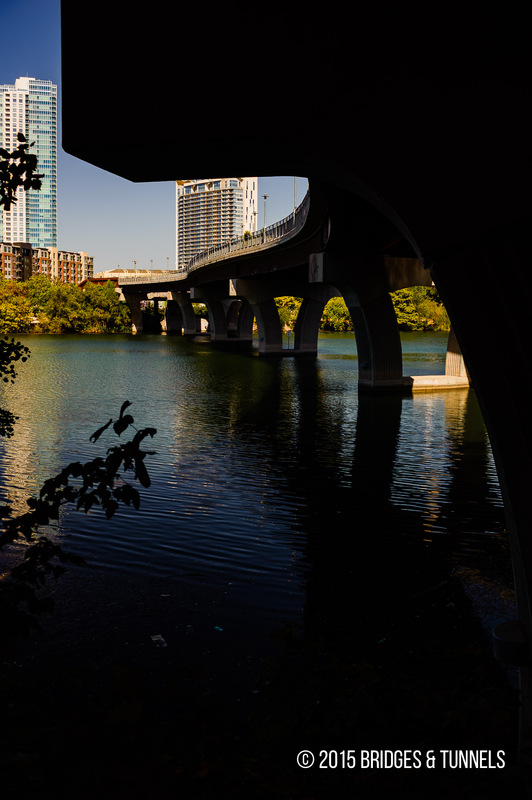 The bridge was named the James D. Pfluger Pedestrian and Bicycle Bridge in honor of the Agustin architect who conceived the trail system on both sides of Town Lake. Construction began on March 15, 2010 3 on Units F and G which had been eliminated in the initial bidding process.1 The project involved the closure of West Cesar Chavez Street in order to build the overpass in one weekend. The 207-foot extension was completed in February 4, 2011 at a cost of $3.5 million. Minor work continued until March 1.3 The extension featured Ipe Ironwood railing sourced from Brazillian hardwood, 32 directional lights and landscaping. An extension of the bike path north under the adjoining Union Pacific Railroad is under the planning stages.1 Work on the underpass has been estimated to cost $900,000 for engineering and $4.5 million for construction. The underpass is designed to be 15 feet wide and several yards long, but the project will involve the relocation of several hundred feet of railroad track. 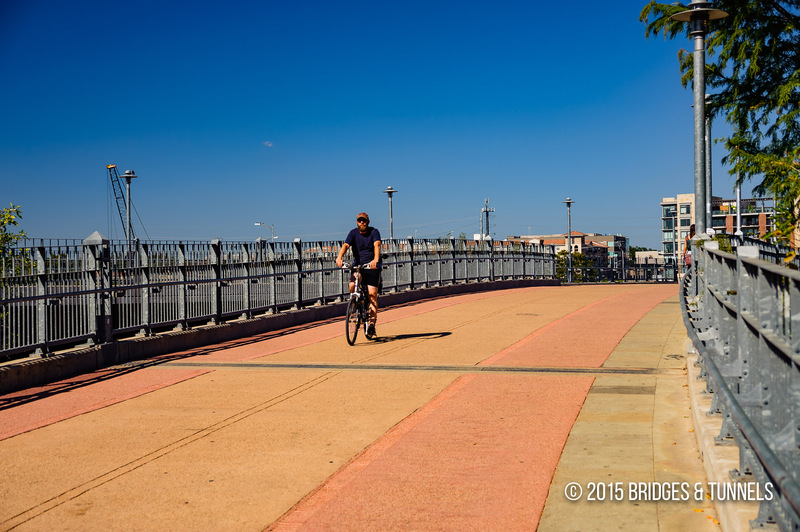 As part of the project, the city has proposed a bridge over West 2nd Street. Wear, Ben. “Pfluger Bridge extension opens Friday.” Statesman [Austin], n.p., 2 Feb. 2011. Web. 7 Nov. 2012 Article. “The Pfluger Bridge Extension.” Capital Excavation. N.p., 2010. Web. 7 Nov. 2012.Article.